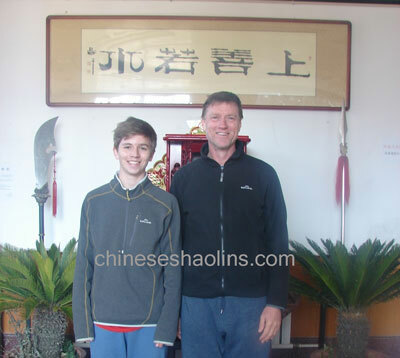 ﻿ Father and son trained shaolin here. I have always been fascinated by China: its long history and culture. A friend of mine was a student at the kunyu mountain school and told me all about it. I have been working very hard and wanted an experience that would be physically and spiritually demanding. That is why I chose to come to the school.I am 52 years old. I came to the school with my 15 years old son. My biggest gain has been the opportunity to enjoy this very unique experience with my son. My second biggest gain is a coordinate. I want to live a long and health life and I believe the practice of Kungfu can help. The two members of school stuff that influenced me the most were my Shifu and Julia the translator. It was such a pleasure to be greeted at the airport by Julia. She is such a happy and skilled. I appreciated how patient and calm she was with me and my son. She has inspired me to work harder and live a good life. I also found the other students to be very welcoming. Everyone looks after each other. I have had a very good experience at the school. I realized that the secret to success is to get into a routine quickly. As I was only at the school for a short time, I decided to work harder during my training and rest during breaks. I always looked forward to meal time. The food was very good and lots of it. I decided to lose some weight and the combination of food and exercise worked. The teaching staff, translators and workers were all very friendly and helpful. On weekends, we went to the local town and city. We had a good time to visit the local shopping centers and tourist sites. We even enjoyed a trip to a Chinese bath house. The landscape surrounding the school is magnificent. The Kunyu Mountains are rugged and beautiful. We went into the mountains to train a few times. I would recommend the school to anyone waiting to learn of develop their martial arts skills or to get fit. I would also recommend it as a great opportunity for fathers to bond with their sons and daughters.Charlie and I would like to thank our shifus(Masters), Julia and all the staff at the school for such as wonderful life changing experience.